Summary: When the Tooting family finds an old engine and fits it to their camper van, they have no idea what kind of adventure lies ahead. The engine used to belong to an extraordinary car . . . and it wants its bodywork back! But as the Tootings hurtle across the world rebuilding the original Chitty, a sinister baddie is on their trail -- one who will stop at nothing to get the magnificent car for himself. What I Think: I love reading books that were made into movies I remember from when I was a kiddo. As an adult I read Alice in Wonderland by Lewis Carroll, Pippi Longstocking by Astrid Lindgren, Mary Poppins by P.L. Travers. When I watched the movies I didn't know they were based off of books. It was interesting to read the books and see how they were different from the movies. When I got Chitty Chitty Bang Bang Flies Again to review, I realized I had never read the original! I listened to Chitty Chitty Bang Bang on audio. It was a quick listen and a fun adventure of a book. 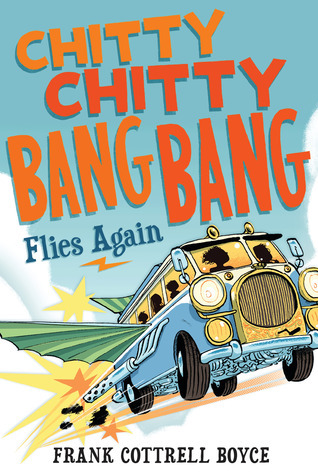 I love how Frank Cottrell Boyce captured the spirit of the first book in this current story about Chitty Chitty Bang Bang. I'm not sure kids today know the Chitty Chitty Bang Bang movie or the book, and they really don't need to to read this book. It definitely can stand alone but I have to say I was a little more excited knowing the first story as I read this one. I could feel the connection and the history with the car. In Chitty Chitty Bang Bang Flies Again, Frank Cottrell Boyce introduces readers to a new family: the Tootings. The Tooting family has three kids, a mom, and a recently unemployed father. It's so funny to see how the three kids relate to their parents and each other. They definitely act their age but it's also still evident that they care for each other and their parents. I love it! This text makes for a good study of characterization and dialogue for young writers. On their adventure they learn about each other, about Chitty Chitty Bang Bang, and about recognizing who they can trust. It's a fun adventure! Writing Prompts: Write about a time when you worked on a project or task with a parent, and adult or any other family member. Describe how you felt while you were working together and when you were finished.